Download "Guide to Health and Social Services"
1 Guide to Health and Social Services Health Services If you have little or no insurance and need health services: You can visit one of the 159 county health departments across the state. The local health departments provide services which promote the health and wellbeing of the whole community. They offer direct healthcare to low-income people and individuals in underserved areas of the state. 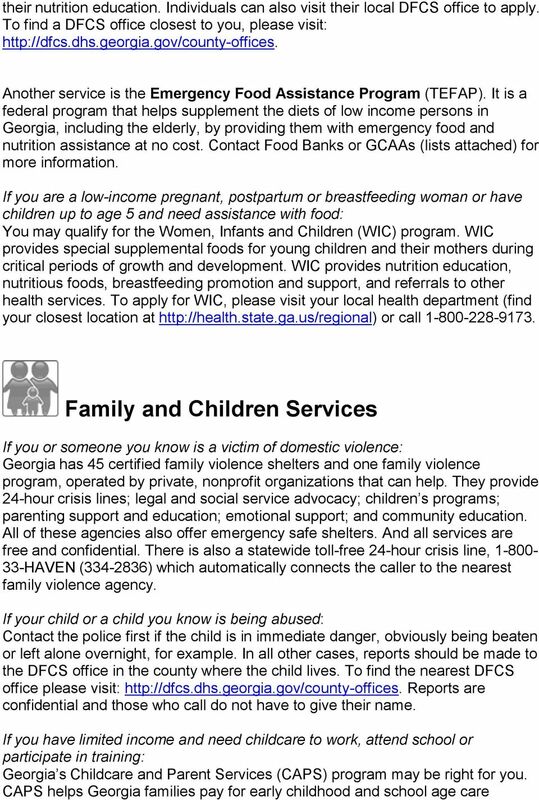 For more information about these services, please contact or visit your local health department. To find a health department in your area visit online If you or your children do not have insurance and need healthcare coverage: You may be eligible for Medicaid benefits. 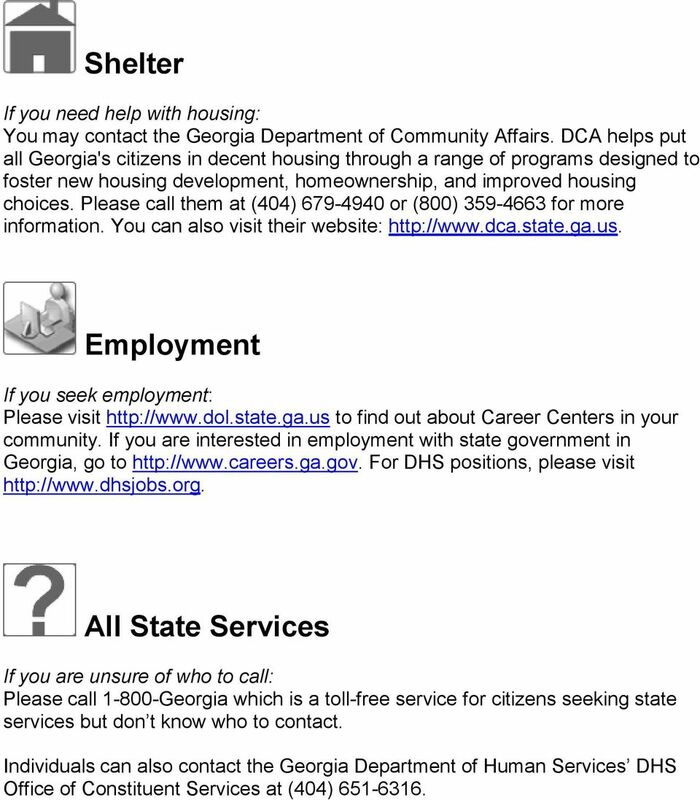 Please visit the Georgia Department of Human Services online tool COMPASS at: to determine if you qualify for Medicaid benefits. 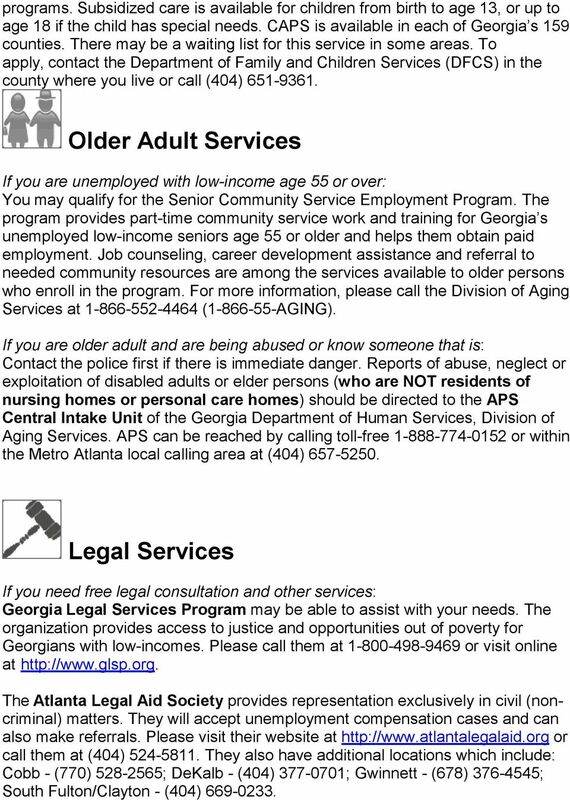 Individuals can also download the Medicaid application, in English or Spanish, from the DFCS website by visiting Applications can be submitted via mail, telephone, fax or to the local DFCS Office. 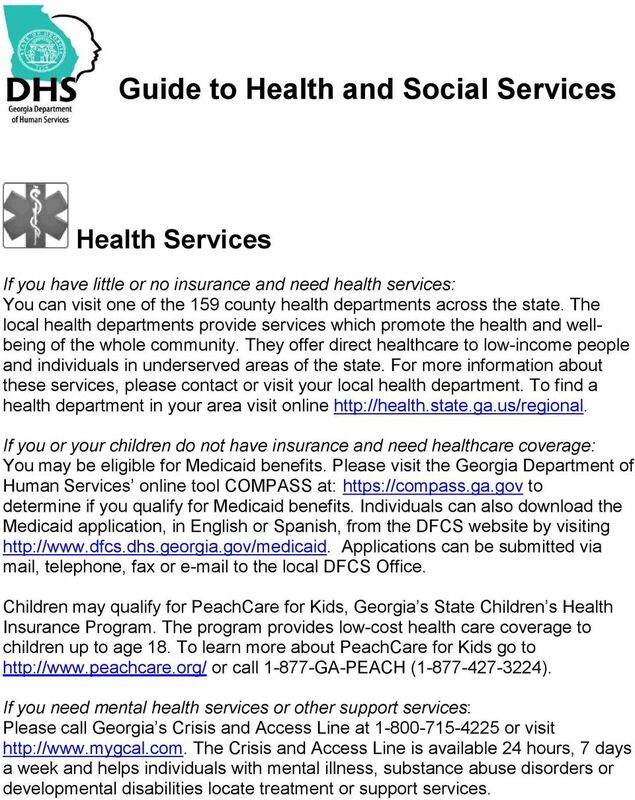 Children may qualify for PeachCare for Kids, Georgia s State Children s Health Insurance Program. The program provides low-cost health care coverage to children up to age 18. To learn more about PeachCare for Kids go to or call GA-PEACH ( ). If you need mental health services or other support services: Please call Georgia s Crisis and Access Line at or visit The Crisis and Access Line is available 24 hours, 7 days a week and helps individuals with mental illness, substance abuse disorders or developmental disabilities locate treatment or support services. A Handbook of Community Services for Parents in Texas Introduction The purpose of this handbook is to provide parents with a list of agencies/organizations that offer services throughout the state of Texas. Nutrition Assistance Programs Nutrition Assistance Programs Federal, state and local governments provide many programs designed to help meet the nutritional needs of people with low incomes and their families. Responses to Hunger in the United States Activity #7 Appropriate for 5 th grade and above- can be adapted for younger audiences. PAIRWN. 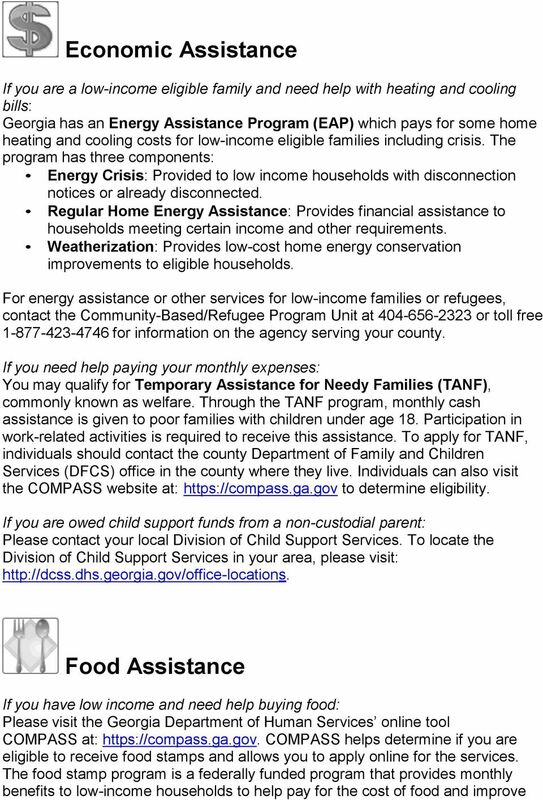 York County Immigrant and Refugee Social Services. Table of Contents. Quick References Organizations that offer a wide variety of services..
CHANGE HAPPEN. TOGETHER, WE RE MAKING PUBLIC POLICY AGENDA LEAD. INSPIRE. MAKE A DIFFERENCE. GIVE. ADVOCATE. VOLUNTEER. Call DO YOU KNOW A CHILD WHO NEEDS FREE OR LOW-COST HEALTH CARE? free phone call from all islands. Please tell your friends and neighbors! FAMILY-RELATED MEDICAID PROGRAMS FACT SHEET ACCESS staff in the Department of Children and Families prepared the Family-Related Medicaid Programs Fact Sheet. It is intended to provide general information. JOBS Program Overview Multnomah County 0 Federal Temporary Assistance for Needy Families TANF A program that provides cash, medical insurance and employment and training services to low-income families. ASSISTANCE TO PARENTS OF CHILDREN WITH DISABILITIES Help is Available As the parent or guardian of a child with a disability, you may have many questions about support and assistance available to you. Alaska. State Supplementation. State Assistance for Special Needs. Medicaid. Alaska. Mandatory State Supplementation No recipients.